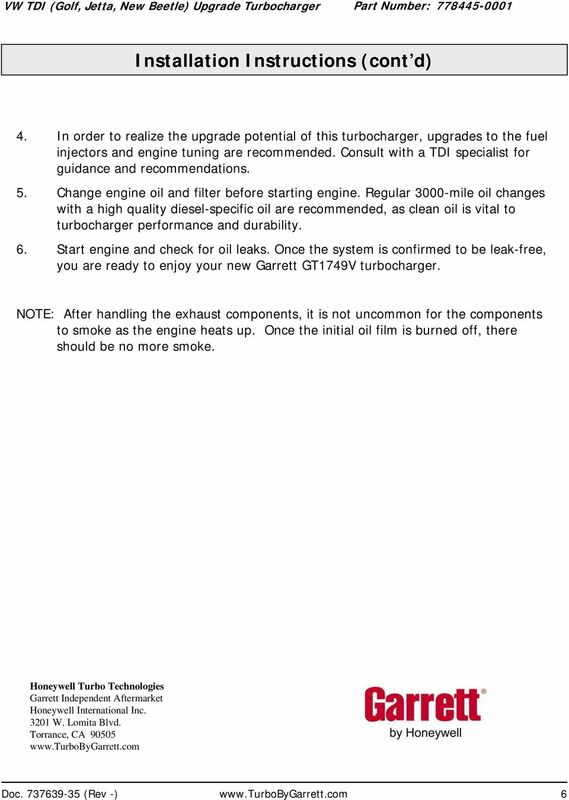 Download "VW TDI (Golf, Jetta, New Beetle) Upgrade Turbocharger"
1 VW TDI (Golf, Jetta, New Beetle) Upgrade Turbocharger Bill of Materials & Precautions.9L TDI BEW-code: A4 New Beetle TDI A4 Golf A4 Jetta Item 2 Parts List Description Turbocharger Installation Instructions Qty Part Number: Tools Needed For installation, use tools recommended in factory service manual Fabrication tools will be required if an EGR cooler adapter tube is desired. 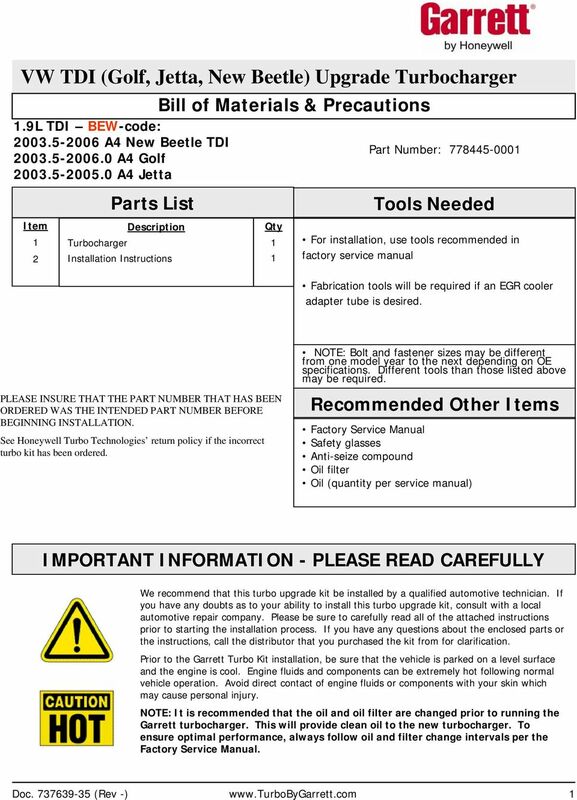 PLEASE INSURE THAT THE PART NUMBER THAT HAS BEEN ORDERED WAS THE INTENDED PART NUMBER BEFORE BEGINNING INSTALLATION. 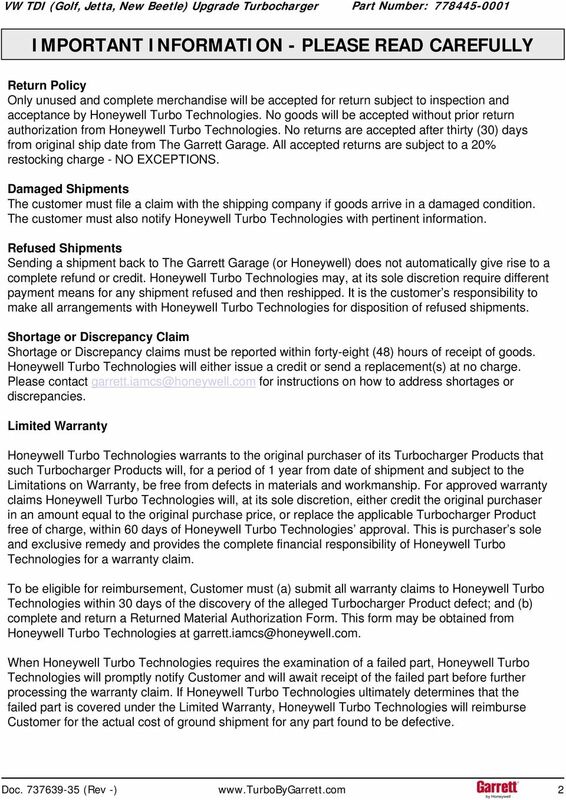 See Honeywell Turbo Technologies return policy if the incorrect turbo kit has been ordered. NOTE: Bolt and fastener sizes may be different from one model year to the next depending on OE specifications. Different tools than those listed above may be required. Recommended Other Items Factory Service Manual Safety glasses Anti-seize compound Oil filter Oil (quantity per service manual) We recommend that this turbo upgrade kit be installed by a qualified automotive technician. If you have any doubts as to your ability to install this turbo upgrade kit, consult with a local automotive repair company. Please be sure to carefully read all of the attached instructions prior to starting the installation process. If you have any questions about the enclosed parts or the instructions, call the distributor that you purchased the kit from for clarification. Prior to the Garrett Turbo Kit installation, be sure that the vehicle is parked on a level surface and the engine is cool. Engine fluids and components can be extremely hot following normal vehicle operation. Avoid direct contact of engine fluids or components with your skin which may cause personal injury. 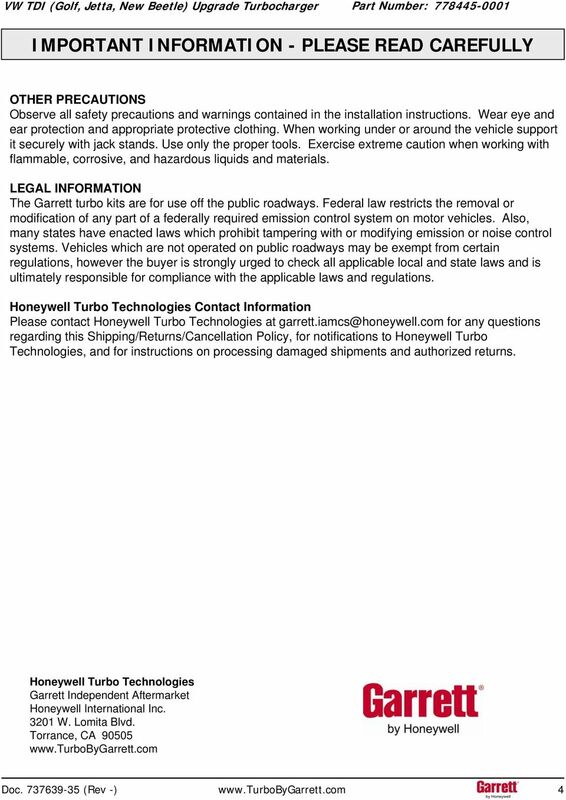 NOTE: It is recommended that the oil and oil filter are changed prior to running the Garrett turbocharger. This will provide clean oil to the new turbocharger. To ensure optimal performance, always follow oil and filter change intervals per the Factory Service Manual. SE-100-1, SE-200-1, SE-500-1, and SE-1000-1 AIR CHAMP PRODUCTS. User Manual SE BRAKE MODELS: (i) MTY (81) 83 54 10 18 ventas@industrialmagza. 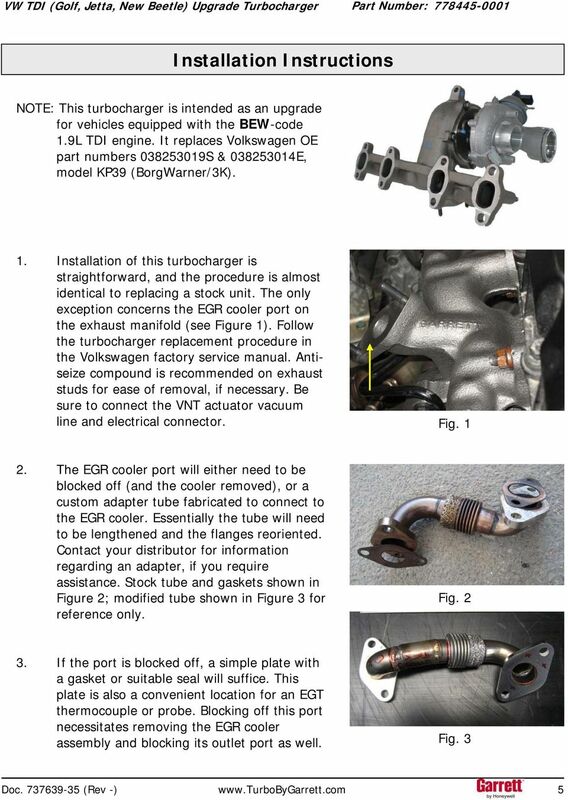 The BEGi 1.6L Mazda Miata Exhaust Manifold Installation and operations manual Applicable to all 1990 to1993 1.6 liter mazda miata Revised 2-22-06 Rev 1.1 1 Thank you for purchasing the BEGi Exhaust Manifold. The BEGi 1.8L Mazda Miata Exhaust Manifold Installation and operations manual Applicable to all 1994 to1997 1.8 liter mazda miata Revised 6-17-07 Rev 1.1 1 Thank you for purchasing the BEGi Exhaust Manifold. 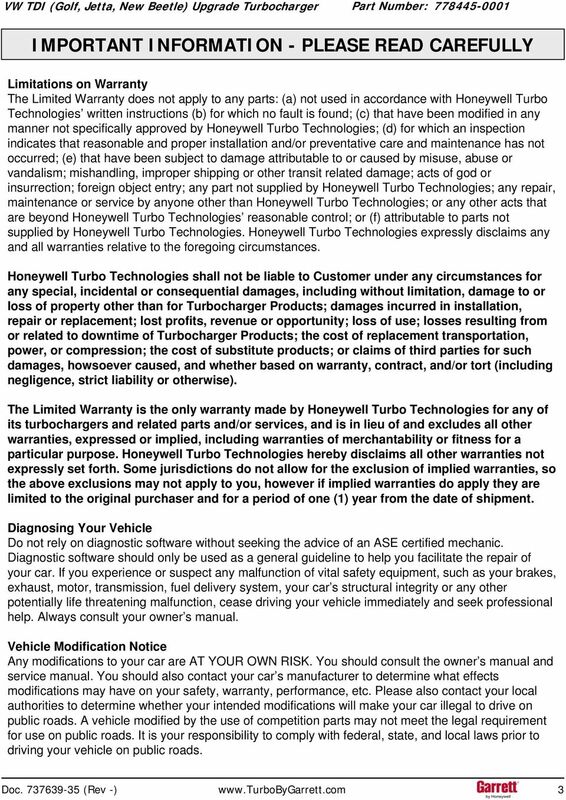 1) By installing this product onto your vehicle, you assume all risk and liability associated with its use. Welcome to Home Wiring Repair Essential. No-cost, no hassle home wiring repairs. Mini Submersible / Fountain / Pond Pump Item 68372 Item 68389 Item 68393 Item 68395 Item 68396 Read this material before using this product. Failure to do so can result in serious injury. SAVE THIS MANUAL.